If there’s one thing I forget about during the holiday baking season, it’s cranberries! I’m all about the chocolate and even gingerbread, but usually cranberries get forgotten in the frenzy of holiday baking. Not this year! 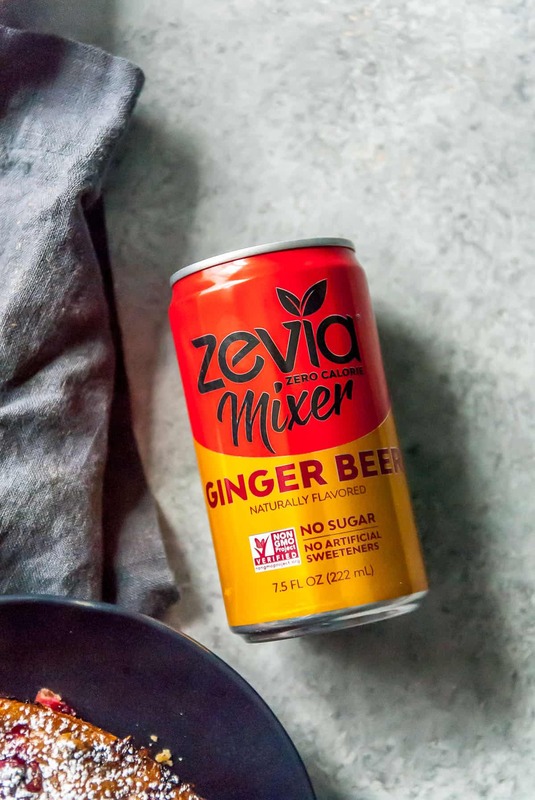 I teamed up with Zevia to create a fun vegan cranberry ginger cake recipe with their new line of mixers, so naturally the first up was ginger beer. I usually use ginger beer in my favorite moscow mule, but what if we used it in baking? Turns out, carbonated mixers are a perfect way to add a little bit of bubbly to our ginger cake, while packing another punch of ginger too. 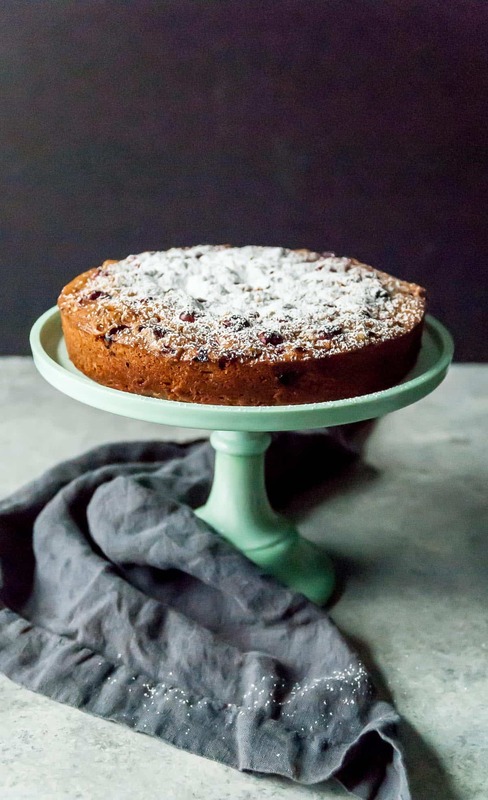 I would classify this cake as more of a cross between coffee cake and cake cake (you know, like layer cake! ), but without the hassle of a layer cake. 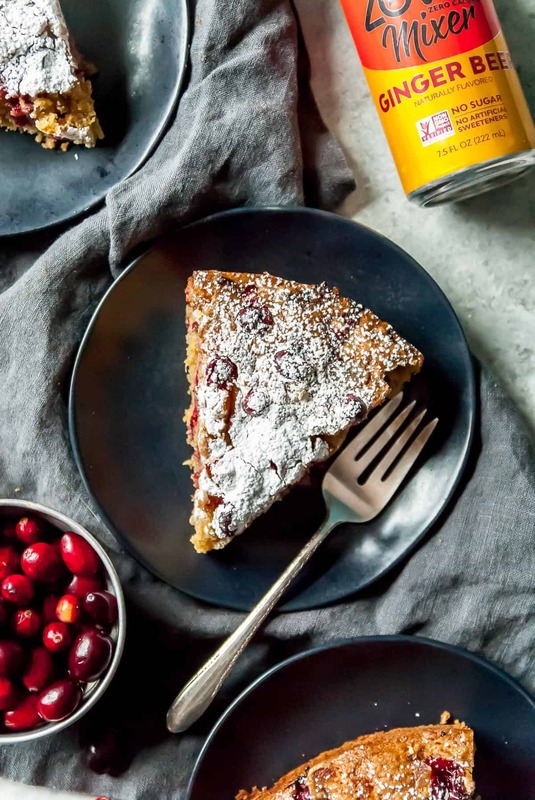 I wanted this cranberry ginger cake to be a little denser than a usual layer cake while packing enough of a cranberry punch to not weigh you down after a big holiday meal or potluck. 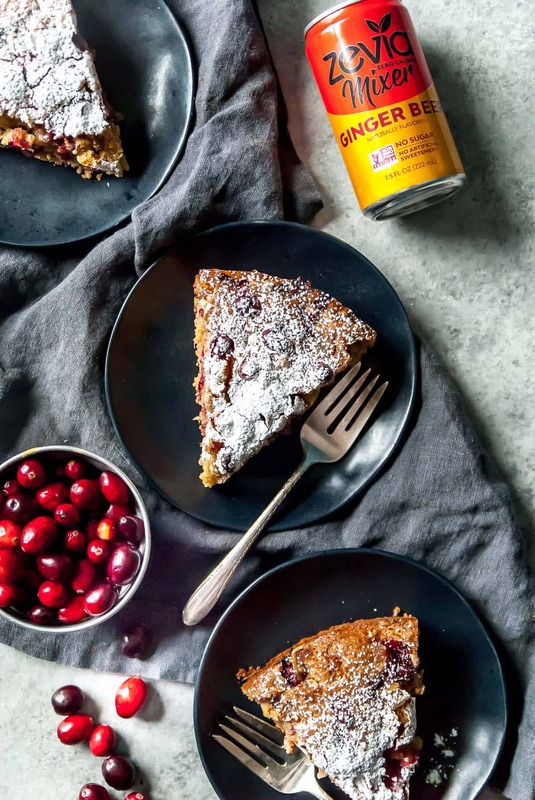 This vegan cranberry ginger cake is sweetened with a mix of brown sugar and granulated sugar since for some reason brown sugar feels more ‘holiday’ to me, is that crazy? It also seems like there is a LOT of ginger in this cake..and there is! I wanted the flavor to really come through and not get lost under the tart cranberries, so I used a combo of dried and fresh ginger, plus the ginger beer mixer. I also topped mine with a handful of chopped crystallized ginger, but that’s totally optional. I also popped a few more cranberries on the top of my cake before baking, but really they didn’t look so pretty after baking, so that part is totally optional. What are you baking this holiday season? 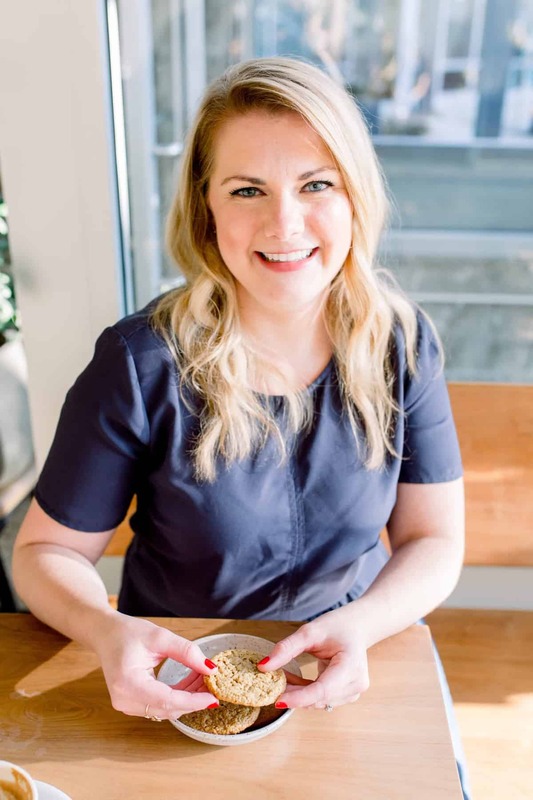 I’m savoring these free weekends before the holidays and trying to pack in all the desserts, so I have a few fun recipes coming in the next 2 weeks! I’m trying to slow down a bit during this busy season, it can be so easy to say yes to everything and I know for my introverted self it always ends in burnout and feeling a little rundown. So, I’ll be taking a little more time in the kitchen (like spending all day making this ginger cake) in the coming weeks and maybe even working on a few savory recipes for the new year. Basically whatever makes me feel the least stressed out, I’m doing that thing. I know the worst time of the year is coming (January-April in the Midwest is BRUTAL), so reveling in the holiday feels for now is my focus. Cheers to cake baking! 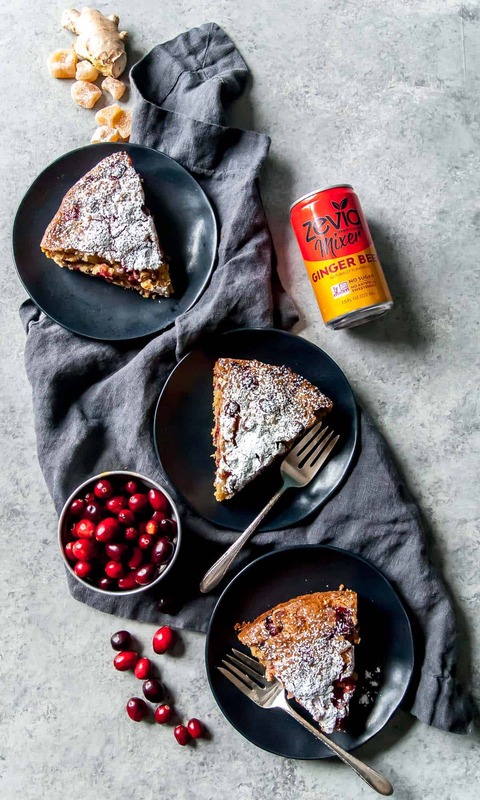 Serve up a slice of fresh cranberry ginger cake! Perfect for your holiday brunch or for your next festive dinner! Made vegan with olive oil and lots of fresh ginger. Preheat oven to 350. Grease a 9 inch cake pan with nonstick spray and line the bottom of the pan with parchment paper cut into a circle. Flour the bottom and side lightly. In a medium bowl, whisk together the flour, cornstarch, baking soda, baking powder, and salt. Set aside. In a large bowl, combine the granulated sugar, brown sugar, olive oil, Zevia Ginger Beer Mixer, apple cider vinegar, dried ginger, vanilla, and fresh ginger. with a hand mixer on medium. Combine until smooth. Add the flour mixer to the large bowl and combine with the hand mixer on low to medium until batter smooth and no batter streaks remain. Add the fresh cranberries and fold in until combined. Transfer the batter to the prepared pan and bake for 40-45 minutes, or until a knife inserted into the center comes out clean. The cake looks great! I will have to keep my eyes open for that Zevia! Question: how deep does the 9 inch cake pan need to be? It would be helpful if 1) the part in the recipe where sugar is listed twice is fixed. This was confusing. I just used the sugar in the second bowl and not the first. 2) I used the spray like it said and it pretty much ruined my cake. It was all wet on the bottom. I used coconut oil spray. I am going to try to make this again without spraying the pan. I would suggest to others not to do this. Hi Amber, sorry the spray didn’t work for your cake!